THE COMEDY KINGS are BACK! When the proprietors of Atlas Plumbing (Abbott and Costello) come to fix a leaky bathroom sink in an uptown home, everyone ends up swimming! The fact that a high society bash is going on downstairsonly complicates matters when their cabbie friend Elsie (Marion Hutton) meets a fancy beau while waiting for the guys to finish their work upstairs. One disaster leads to another and all three outsiderswind up going to the same bigwig shindig out in the country. Witty repartee takes on a new meaning as the identities of the plumbers and the cabbie remain a mystery to the high-stepping guests. Nonetheless, all are the recipients of some unforgettable humour, from trips to the pool to the famous stall down Bagel Street, smashed straw hats and all. When the highbrows finally discover their party-crashers true selves, the learn a lesson in humility after convincing the poor fellows of a crime they didnt commit. 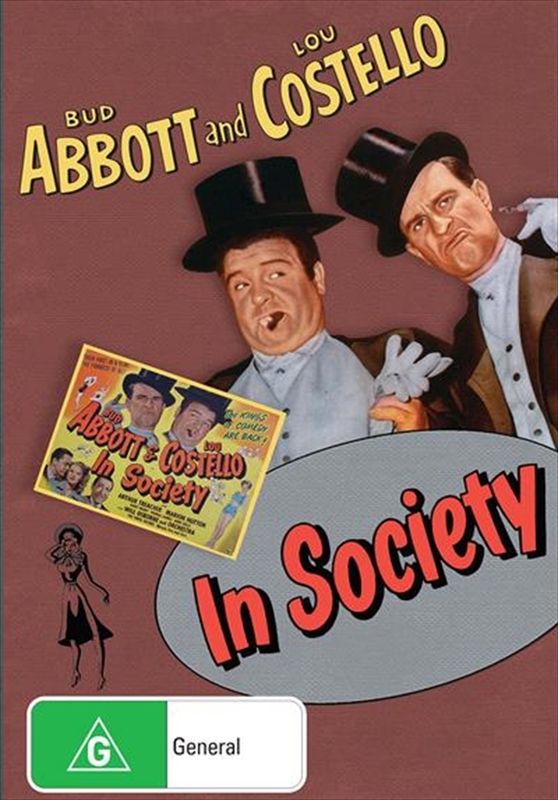 Music and merriment combine to make In Society one of the most entertaining Abbott and Costello films ever made. If youre not careful, you might just split your pipes laughing!